Assemble all salad ingredients save the pomegranate and the juice and zest of 1 lime in a very large bowl and mix well. Pour the juice and pomegranate seeds over the top and leave while preparing the chicken. Shred the pre-cooked chicken and place in a separate bowl. In a small dish, combine the peanut butter, chilli, garlic, vinegar and the juice and zest of the other lime before pouring over the shredded chicken breast. 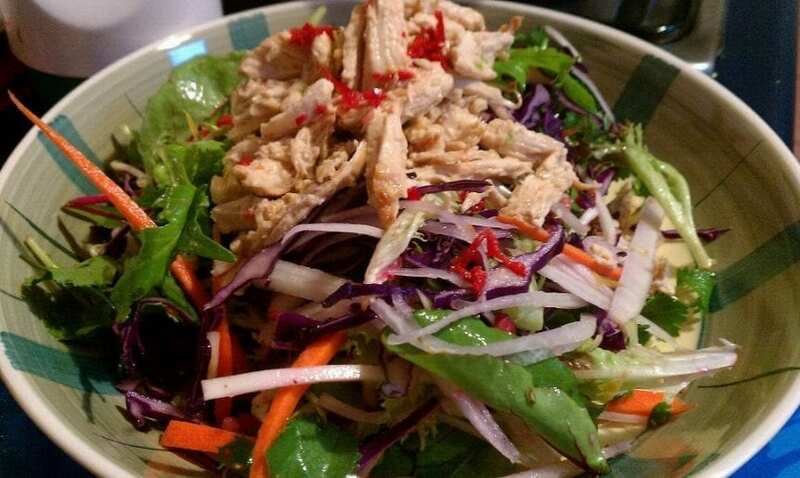 Serve the chicken on top of the salad and garnish with extra chilli and coriander.